What are the benefits of a college degree in a down economy? Several media points have recently called the benefits of a college degree into question, in light of factors including stagnant employment numbers and increasingly high student debt. For instance, in Newsweek's cover article, "Is College a Lousy Investment?" the author comments that "the extra time and money spent pursuing a college diploma will leave [people] worse off than they were before they set foot on campus." But it's a much more complicated issue than it seems. For instance, there's significant evidence underscoring how major career accomplishments can't be achieved without a college degree. We wanted to provide a counterpoint to those who say a college degree isn't worthwhile and share with you the five biggest career-focused benefits of a college degree. the more you'll make over your lifetime. People with a college degree earn more over their lifetime. We've said it before, but it remains one of the most important factors in the college degree debate. A college graduate can expect to earn about $2.3 million over their lifetime, while a high school graduate can expect about $1.23 million, on average. This is according to a Georgetown University study titled "The College Payoff: Education, Occupations, Lifetime Earnings." The study also estimates bachelor's degree holders make 74 percent more over their lifetime than high school graduates. Obtaining a bachelor's degree also opens the door for further academic endeavors. According to the study, those who hold a graduate degree can expect lifetime earnings at least double that of those with only a high school diploma. 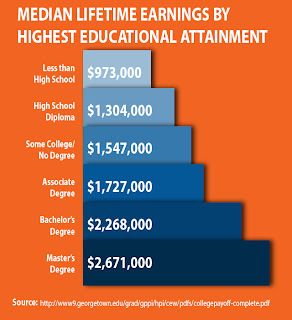 Graduate degree holders have median lifetime earnings of $2.7 million. College graduates are less likely to be unemployed. Another Georgetown University study, "The College Advantage: Weathering the Economic Storm," found that while unemployment rates for college graduates went up during the recession, they never exceeded 6.3 percent. This is much lower than the peak 13.4 percent unemployment in the U.S. for high school graduates during the recession (February 2010). What's more, now that the economy is recovering, college graduates continue to maintain higher employment rates. The current unemployment rate for college graduates over the age of 25 stands at 4.1 percent as of August 2012, while the unemployment rate for high school graduates is currently 8.8 percent in the U.S.
Those with a college degree have more job prospects right now. A net positive of 200,000 jobs were added for those with at least a bachelor's degree during the recession. Meanwhile, a net of 5.6 million jobs were lost for those with just a high school degree. In the recovery, college-educated workers have added over 2 million jobs while high school graduates have lost 230,000 jobs in the same time frame, according to "The College Advantage: Weathering the Economic Storm." Much of this is because of the long-term decline in low-skill jobs in the American economy, resulting from advances in labor-saving technology. For example, the U.S. shed 5.5 million jobs in manufacturing from 1980 to 2007 -- an industry that usually required just a high school diploma. However, in that same time period, 11.6 million jobs were created in healthcare and education -- many of which require some type of higher education. College graduates are projected to have increased job opportunities over the next eight years. Not only did a college degree improve an individual's job prospects during the recession, the Bureau of Labor Statistics projects that a college degree will continue to equate to increased job opportunities over the next eight years. The organization estimates occupations requiring a bachelor's or associate degree will grow by 17 percent and 18 percent, respectively, by 2020. However, occupations requiring just a high school diploma are projected to grow only 12 percent in the same time frame. Continuing the trend, if an adult learner takes the extra step and earns a master's degree, occupations requiring it are expected to grow by 22 percent. 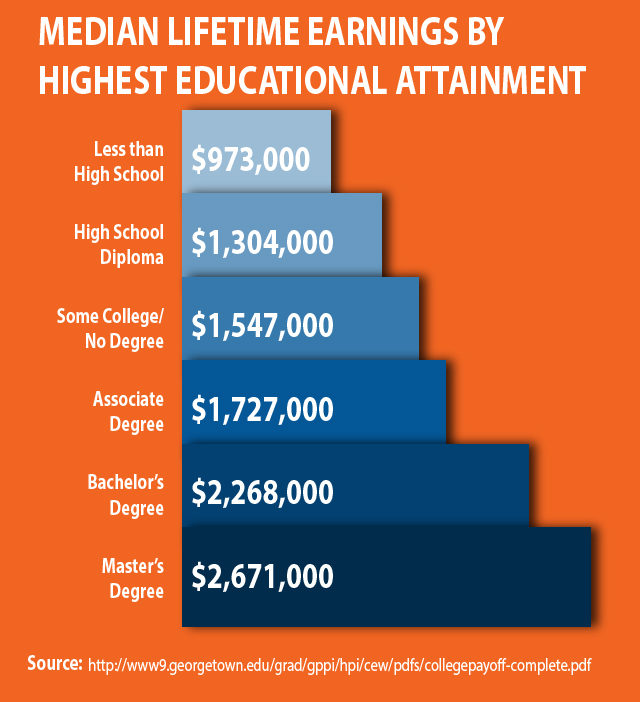 A college degree provides a high ROI. As mentioned above, degree holders can expect to earn about $2.1 million over the course of their lifetime. Earning a college degree costs a fraction of this, leading to a significantly high ROI. That ROI can also be increased by taking advantage of financial aid, scholarships, and grants that are often available. Moreover, a study conducted by The Brookings Institution, a nonprofit public policy organization based in Washington, D.C., found that a roughly $100,000 investment in a college degree provides a 15.2 percent return for those who earn the average salary for college graduates. This is more than double the average rate of return in the stock market during the last 60 years, which stands at 6.8 percent, and more than five times the return to investments in corporate bonds (2.9 percent). It remains to be seen exactly how the country will continue to recover from the economic recession, and how this will correlate to projected job creation in the coming months and years. However, data clearly shows how a college degree has and will continue to improve job prospects and retention in the United States through economic cycles. A college degree remains a time-tested foundation for career and life success.